While the question of when cannabis retail businesses will open in Massachusetts remains unanswered, where those businesses will operate is becoming clearer. 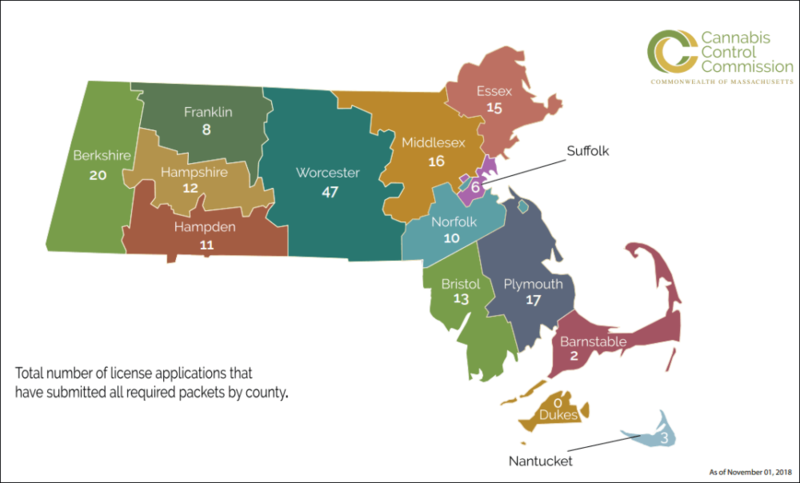 Cannabis companies — which include retail, cultivation, product manufacturing, testing, transport and research — have been proposed in 58 Bay State communities, from Nantucket to western Massachusetts. An examination of the list of license applications that have been granted, or are in the pipeline, puts in focus areas of the state that may soon be realizing a cannabis green rush as the nascent industry gets up and running. Marijuana business applications, by county. Cannabis clusters appear to be materializing in north-central Massachusetts, Essex County, the Blackstone Valley, the Pioneer Valley and Berkshire County, where in the city of Pittsfield eight businesses have applied for 11 licenses. “It certainly has the potential to be a job creator and a source of new tax revenue,” said Pittsfield Mayor Linda Tyer. She originally proposed a limit of 10 licenses, but the city council expanded that number to 35. Tyer said city residents seem to be open to the arrival of the new industry. “It’s something that the citizens of the commonwealth embraced in a referendum," she said. "We feel like we've got a zoning ordinance that allows for the establishments to open up and operate but also has some protections in place." The city of Fitchburg is near the top of the list statewide when it comes to the number of license applications that have been submitted. Five different businesses are looking to set up shop in Fitchburg and have submitted 11 applications to the CCC: one retail license, five cultivator licenses and five product manufacturer licenses. Clusters of licenses are being sought in other parts of Worcester County. A dozen applications have been submitted in the city of Worcester and its neighboring town Leicester just to the west. Cultivate in Leicester has been granted final licenses to grow, process and sell cannabis and cannabis products to the adult-use retail market. Cultivate, New England Treatment Access in Northampton and Pharmacannis in Wareham are so far the only businesses to be awarded final retail licenses by the state’s Cannabis Control Commission, although the stores have not yet been issued a notice to commence operations by the commission staff — the final official signoff before the doors are open to the public. The commission has been methodically processing the license applications for the past five months. As of Nov. 1, 12 final licenses have been issued to six different businesses. Fifty-two provisional licenses have been issued since June.